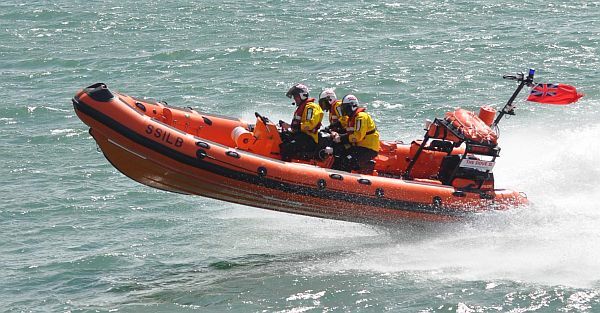 Sandown & Shanklin's Independent Lifeboat, the Dove II, is an ex RNLI 'B' class Atlantic 21 rigid inflatable boat (RIB) powered by twin 70hp Evinrude engines. It is fitted with a state of the art satellite navigation system, GPS Chart plotter and the latest in radio communications. It can hold 148 litres of fuel which gives the ability to travel for up to 3 hours at top speed. The boat carries first aid equipment, a fire extinguisher, a variety of ropes, search lights and flares. The Lifeboat is equipped with a self-righting device in case of capsize and is crewed by two crew members and a coxswain. All crew hold current First Aid, VHF/DSC Certificates and are fully trained in all aspects of sea rescue.